superdumb supervillain: Join the Winning Team! Huggies Clean Team is a new line of bath and body products designed to involve toddlers in their own hygiene. 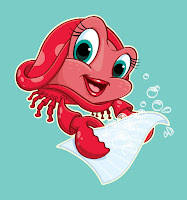 Each specific product is associated with a cute cartoon animal who encourages cleanliness and teamwork. We received three products to try: the foaming hand soap, flushable moist wipes, and extra conditioning shampoo. The Blue Melon Splash scent featured throughout the line is pleasant but not overpoweringly fruity and the containers are appropriately sized for small hands. The foaming hand soap was, uh, hands-down, our favorite. It's a product that gets used quite often but apparently, we weren't doing it right. When you press down on his head, Henry Hippo flashes a light for twenty seconds, letting you know the appropriate amount of time to lather up. Who knew twenty seconds was so long?! It's a gimmick but it underscores the importance of proper washing technique. Plus the soap comes out foamy (always a bonus!) and larger refill sizes are available so you don't have to pitch Henry when he's all empty. The flushable moist wipes are great, not least because they're flushable. The compact size of the case makes it easy to toss into a purse or diaper bag, which I imagine would be great for potty training. The scent seems less overpowering since the last time I bought Huggies flushable wipes, almost two years ago when Roo was giving up diapers. We had to switch to an unscented brand of flushable wipes because the others gave her a rash. These seem to have been reformulated to be more gentle on tiny tushies. The extra conditioning shampoo was nice. Roo liked Sammy Snake but her mess of curls probably needs the added boost of Daphne the Dolphin's Spray-on Detangler, which is the next Huggies Clean Team product we'd like to try! View the complete line of Huggies products online or in stores near you.